I did not watch the majority of the Oscar broadcast because I had better things to do. There were zombies to be killed over on The Walking Dead. It was an entire episode about Daryl! Who cares about the Oscars? 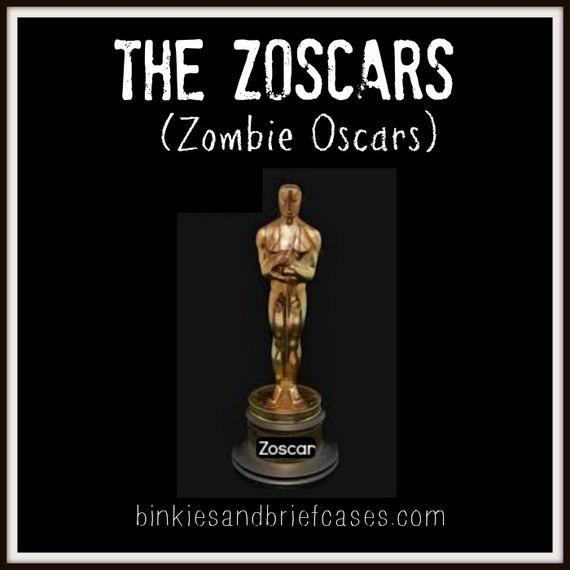 So, I thought it would be fun today to do my own Walking Dead Zombie Oscars. First, there would be a red (because, you know, blood) carpet show with my boyfriend Chris Hardwick, the host of Talking Dead. Hershel. We miss you, man. You were good people. Laurie. You were a selfish brat and a terrible mother. It's the apocalypse, watch your kid and stop sleeping with your husband's psycho friend. Daryl. Maybe Daryl should just win everything. Glen and Maggie. If one of you dies before you find each other again, I'm going to be so mad. Rick. Ok, maybe not MOST likely, but I've kind of lost sympathy for you and you're not in good shape, man. Carol. I'm 95% sure Lizzie killed Tyreese's girlfriend. Carol gave Lizzie her knife right before that happened. -Lizzie tries to kill Judith, they all realize she killed Tyrese's girlfriend, Tyreese goes nuts, Carol kills Tyreese. -Beth and Daryl hook up. Beth dies. Do you have any crazy predictions to add to the list? Awards you'd like to give?